Philadelphia, PA, (June 2, 2017) – Scholarship awards for Greek-American college/university students from the greater Philadelphia region were announced yesterday by the Hellenic University Club of Philadelphia (HUC). Fifteen students were awarded scholarship grants totaling $45,000 during the club’s annual Scholarship Awards Dinner at The Radnor Hotel in St. David’s, PA. The HUC Scholarship Program is the largest scholarship initiative among all Greek-American organizations in the Philadelphia region. From HUC’s inception, the founders set a goal of establishing scholarships to aid Greek-American college and university students. To date, the Hellenic University Club has awarded $710,000 in scholarship grant aid to 327 undergraduate and graduate students. In addition to the scholarship recipients, HUC also honored Dr. Constantine F. Harris during the Awards Dinner. Dr. Harris, a physician and medical researcher at the Center for Urologic Care of Berks County, recently won the top prize – along with his two brothers, George Harris and Dr. Basil Harris – in a global competition sponsored by the QualComm Foundation; 17 teams of research scientists were challenged to design an X-Prize Tricorder device (much like that seen in the original STAR TREK series). 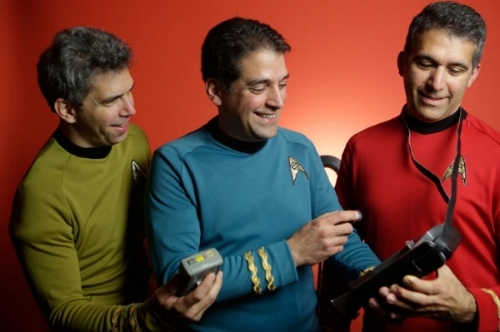 The $2.6 million first prize will enable the Harris Brothers’ startup company, Basil Leaf Technologies, to continue developing their tricorder design. Named DxtER (pronounced DEXTER) this handheld mobile device will be capable of diagnosing and interpreting 15 medical conditions and capturing five vital health metrics – something vitally needed by millions of people living in remote regions of the world where health care is often very limited or unavailable. Dr. Constantine F. Harris received a scholarship from the HUC in 1996. His younger brother, Dr. Basil Harris, received two scholarships from the Hellenic University Club, one in 1999 and again in 2000. Past scholarship recipient, Basil Harris joined CNN to discuss how his love of Star Trek inspired him to take on the challenge of building a real life Tricorder. He details the process for CNN, including building the medical kit on his kitchen table with his brother Gus and his team. We're proud to see Basil and Gus contributing to the new revolution in healthcare, and congratulate them again for winning the Qualcomm Tricorder Prize. Watch Basil's full interview here. Congratulations go out to Basil Harris and his brothers Gus and George on winning the top prize of $2.6M in the QualComm Foundation’s X-Prize competition for their hand-held diagnostic device that detects pneumonia, diabetes and other diseases. Final Frontier Medical Devices, led by Basil Harris, an emergency-room doctor at Lankenau Medical Center, beat out 312 entrants from 38 countries, many with corporate and government backing. Basil and Gus Harris are both doctors who received scholarships through the Hellenic University Club of Philadelphia during their studies. We’re proud to see them doing great work in healthcare and achieving accolades! Jonathan C. Limberakis, DMD is General Dentist in Abington, PA and past recipient of the both the Paideia and Nicholas S. Hetos, DDS Memorial scholarships. Who are you and how were you first introduced to the Hellenic University Club? Jonathan C. Limberakis, DMD. I am the son of Cary and Alexis Limberakis. I grew up in suburban Philadelphia and consider myself to be part of the St. Sophia and St. Luke communities. I graduated from Villanova University in 2010 with a B.A. in history and subsequently earned my doctorate in dental medicine at the Temple University Kornberg School of Dentistry in 2014. I became aware of the HUC at a young age since my parents have been long-time members and attended or were involved in many of its activities. My first direct introduction to the club was when I was applying to college and applied for a Hellenic University Club scholarship. How did your scholarship help you to achieve your academic goals? The cost of attaining higher education is certainly daunting and so any and all financial relief is welcomed to relieve the heavy burden. In 2006, I received the HUC’s Paideia undergraduate scholarship. Several years later, I applied, as an incoming dental student, and was awarded the Nicholas S. Hetos DDS Memorial Scholarship. These scholarships helped to lighten the expense of pursuing my degrees. How has your Hellenic University Club scholarship played a role in helping you get to where you are professionally? While I am still in the infancy of my career, I acknowledge the role the organization can play in networking and career development for young professionals. Those scholarships not only helped ease the financial burden that comes with pursing higher education, but also are a reminder that the Hellenic community is invested in their young people. I am a general dentist practicing in both Abington, PA and in Voorhees, NJ. In Abington, I work alongside my father - a dream come true. Recently, the two of us opened up a brand new office, something many years in the making and certainly required lots of focus and hard work. Our office colors and logo even pay homage to our proud Greek ethnicity! In what other ways do you celebrate your Greek heritage? I try to stay active in the Greek community as much as possible, not only in Philadelphia, but also throughout the country. My most formative memories are spending time in Greece as a counselor at the Ionian Village in 2010 and 2011. At Villanova, I majored in history, and concentrated on the Greek and Byzantine civilizations. Almost everyday I hear myself explaining to patients that being of Greek descent I have blue blood coursing through my veins! What is your favorite story related to being a part of the Hellenic University Club? Receiving the scholarships in both high school and then dental school is certainly a very fond memory. I remember how proud my parents were, being that they have been members of the HUC for many years. Recently, I have to thank the HUC for bringing a new brother to my family. My sister Alyssa met her husband, Peter Millili, at an event hosted by the organization! I also enjoy going to its social functions. Is there anything you’d like to say to other students considering applying for a scholarship through, or joining the Hellenic University Club? Give yourself the best opportunity to succeed both academically and financially and apply for a scholarship! The cost of attaining a degree in dentistry is approximately $290,000 nationwide (not including an undergraduate degree), so every little bit helps. The Hellenic University Club is comprised of many hard-working, intelligent, and devoted people who want to see the Greek community thrive in this area. Embrace that community and it will pay dividends. Kostis Kourelis is Associate Professor of Art and Art History at Franklin & Marshall College and past recipient of the HUC’s Paideia and Padis scholarships, who was originally introduced to the organization by his parish. Who are you and how were you first introduced to the HUC? I learned about the HUC from our parish, Saint George Cathedral in Philadelphia, where my parents were very involved. Although tuition was much cheaper in 1986 than today, the cost of college was a substantial hurdle, particularly for a family that had emigrated from Greece just five years earlier. How has your HUC scholarship played a role in helping you get to where you are professionally? Beyond the financial assistance, a scholarship by the HUC introduced me to a community that was deeply invested in Greek culture. This gave me the confidence to pursue a less professionally-oriented career in the liberal arts and the life-long study of Greek culture. I am a professor of Art History at a small liberal arts college. I specialize in the history of architecture and archaeology. Franklin & Marshall College has a strong Classical Studies department and small community of Greek American and Greek students; unfortunately, we do not teach Modern Greek. In the summers, I direct an archaeological project that focuses on deserted Greek villages. In my teaching, I promote the history of Greek culture through courses on the History of Architecture, Byzantine Art, and the Architecture of Migration. My research does not focus on the glories of Ancient Greece, but on periods of multicultural interaction with other civilizations in the medieval and early modern period. I celebrate periods that are traditionally seen as period of decline, such as the Frankish, Ottoman, and Modern periods. Most recently, I have been focusing on the archaeology of immigration. I think that excavating the backyard of a 1920s Greek immigrant row house in Philadelphia should be as important as excavating the Parthenon. What is your favorite story related to being a part of the HUC? While still just a senior in high school, I attended the HUC reception for the award winners. There, I met the recipient of the graduate award who was a student starting medical school. At the reception, we complained about the parental pressure to study something practical, like law or medicine. We also discovered that we both played bass guitar in the Philadelphia music underground and were part of a bohemian scene that our parents, the Greek American community, and probably the HUC would condemn. But ultimately, it was the HUC that brought us together. We became close friends. And we also found ways to better synthesize our rebellions with our professions. For his medical degree, he traveled through Greece collecting natural healing recipes from old grannies and then tested them in a lab. For my architecture degree, I travelled through Greek villages studying ruined houses. The HUC brought us together. Is there anything you’d like to say to other students considering applying for a scholarship through, or joining the HUC? Do not be afraid to think outside the box. Think of the unusual experiences that you have had as a member of the Greek community and turn those experiences as opportunities to break the mold of whatever professional track you aspire to. Coming from Greece or the Greek diaspora has provided you with an extraordinary transnational perspective. The challenges of the 21st century are all global. A migrant heritage aligns you with the experiences of today’s migrants, whether they are undocumented Hispanic workers in your neighborhood, or the 10% of Greece’s professionals who have fled the country since the recent economic crisis. Vasiliki Triantafillou is a third year medical student at the Perelman School of Medicine, University of Pennsylvania. She is a past recipient of the Hellenic University Club’s Padis and Founders Scholarships. I feel quite lucky to have learned about the HUC because for me, it was really a case of being in the "right place at the right time." I happened to be home from college and attending services with my family the same weekend the scholarship committee was visiting our church, St. Thomas Greek Orthodox Church in Cherry Hill, NJ. During this visit, I not only learned about the scholarship opportunities available but also the larger mission of the HUC rooted in creating a community of Greeks all invested in the lifelong pursuit of "paideia." An education is an investment and it is organizations like the HUC and their scholarship program which helps to offset the cost of higher education and allows one to make such an investment in one's self, in one's heritage, and in one's community possible. The HUC's commitment to education through the scholarship program is a reminder of our own responsibility to inspire a love of learning in future generations and to do so with gratitude to those who have done the same for us. As a recipient of two HUC scholarships, I have fully embraced this responsibility and have made it a professional goal of mine to incorporate teaching and mentoring into my career. To this end, I have been involved in a number of teaching and mentoring activities throughout medical school from developing an after-school health science program for elementary school students in West Philadelphia to the informal "near-peer" mentoring of my underclassman colleagues to most recently pursuing a certificate program in medical education. I am a third year medical student at the Perelman School of Medicine at the University of Pennsylvania. I am still deciding, "what I want to be when I grow up." My Greek background has been a significant part of my life from the formative experiences and fond memories of entire summers spent in Greece to the love shared by three generations of Greek women "doing damage in the kitchen" around the holidays, to the values rooted in Greek culture, history, and identity that serve as my daily moral compass. More simply, there isn't a single day that I'm not speaking, eating, or thinking Greek! One of my favorite HUC events is the annual Opening Reception in September. In one room, members across all ages and professions gather to share food, stories, and laughter. The energy and enthusiasm in the room is simply contagious! It is a true honor to be part of this community. Apply! Join! The scholarship program is a wonderful opportunity and as my initial introduction to the HUC, inspired me to join this rich community of like-minded individuals when I moved to Philadelphia. Membership in the HUC offers a connection to the Greek community as well as a number of social and networking opportunities, which are important to me and a void I felt when I graduated college and no longer had a Greek community in the form of a student cultural organization. 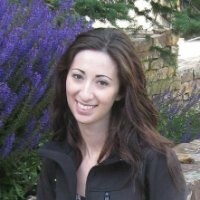 Joanna Krystal Sandilos is a Senior Medical Writer and past recipient of the Hellenic University Club’s Paidea and Padis scholarships. She was originally introduced to the organization by her parents. I was first introduced to HUC through my parents. They have been active members for as long as I can remember, and were the first to suggest that I apply for the Paidea scholarship. Both the Paidea and Padis scholarships provided some financial flexibility, which allowed me to focus more on my studies in both undergraduate and graduate school. In addition, going through the application process helped me to think through my professional goals throughout my academic career. I was able to accomplish more in graduate school, like applying for, and being awarded research grants; participating in invited guest lectures for the nursing school and presenting my work at scientific conferences. These activities allowed me to obtain my postdoctoral fellowship at Fox Chase cancer center, from which I was recruited into my current position. I am a Senior Medical Writer, at a medical communications agency. We work with pharmaceutical clients to coordinate and develop scientifically accurate and transparent literature from large clinical trials and help get drugs to market. My Greek heritage permeates all aspects of my life! Any major life event - like the birth of a child, a wedding or christening, or a holiday is infused with Greek tradition. Every other day, my heritage influences my life in more subtle ways such as religion, language, cooking, and values. The HUC has impacted my life most so far by awarding me the Paidea and Padis scholarships. I hope to become more active in the future and accumulate more "stories" related to the HUC. I especially look forward to participating in a professional mentoring program when it comes to fruition. In addition, I look forward to raising future HUC members and inspiring my children the way that my parents did for me. Apply! Don't be shy, and reach out to your community. Community ties that you establish early in your academic career can strengthen over time and become one of your biggest assets.